What is the Bonny Method? The Bonny Method of Guided Imagery and Music is a music-centered, consciousness-expanding therapy developed by Helen Bonny. Therapists trained in the Bonny Method choose classical music sequences that stimulate journeys of the imagination. Experiencing imagery in this way facilitates clients’ integration of mental, emotional, physical and spiritual aspects of well-being. Inspired by a mystical experience while playing the violin, Helen L. Bonny, Ph.D., felt called to bring others to the healing power of music. 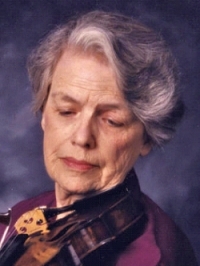 She used her unique understanding of music in the early 1970s at the Maryland Psychiatric Research Center, as part of the federal government’s research into the consciousness-expanding effects of LSD. Although she began by combining relaxation techniques and classical music selections to facilitate the experiences of research subjects while they were under the influence of the drug, through opportunities to offer sessions without the drug it became evident that the music itself was its own agent of change. This realization led her to continue to develop the Bonny Method and after leaving the Center further research and define The Bonny Method. FAMI stands for Fellow/Facilitator by the Association for Music and Imagery. A designation of FAMI indicates that the practitioner has completed the three levels of training, an in-depth application process, and approval by both their trainer and the AMI. If a Fellow maintains membership in AMI, this further indicates that she or he has maintained continuing education and ethics requirements. To find a qualified Bonny Method Practitioner, look for a person with the FAMI designation. Search our Practitioner Directory for a FAMI near you. If you are interested in pursuing the designation of FAMI, you may learn more about training here. Who is the ideal Bonny Method client? The Bonny Method has been used successfully with adults, adolescents, children, persons in recovery, psychiatric inpatients, terminally ill patients, and others. In a session lasting up to two hours, you and your therapist discuss your current life situation, set goals for your work together, and establish a focus for the session. After a guided relaxation, you then listen to music selected by the therapist to address the themes that arose. You verbalize the images, feelings, sensations, memories, and any awareness evoked by the music, allowing them to become a vehicle for exploring deeper states of consciousness. Your therapist interacts verbally with you to help you develop and expand your imagery experiences. At the close of the music, your facilitator assists your return from the deepened state and reinforces your insights that arose during the exploration. Your music and imagery experiences are reflections of you and are unique to your personal relationships, feelings, and personality. You may have glimpses of transpersonal inspiration that both challenge and reinforce your sense of who you are and who you can become. Your creativity may be awakened. You may gain new perspectives on your life issues and may feel empowered to address them with renewed energy. Is there research or documentation to support The Bonny Method? Yes. Both qualitative and quantitative research methods have been applied in the study of the Bonny Method. Many written accounts of explorations into the potentials, effectiveness, and applications of The Bonny Method appear in professional journals and books, resource newsletters, and in peer reviewed publications such as The Journal of the Association for Music and Imagery. Membership in the Association for Music and Imagery (AMI) is open to anyone who is interested in The Bonny Method and supports AMI and its mission. AMI’s current membership includes Fellows/Facilitators, Primary and Associate Trainers, Students, and Supporters of The Bonny Method. Professionals in a variety of therapeutic and healing modalities have been trained in The Bonny Method and are actively incorporating it into their chosen fields. All AMI members pledge to take personal responsibility to uphold the AMI Code of Ethical Conduct. What are the benefits of AMI membership? Reduced prices on all AMI professional resource materials including DVDs etc. What was The Bonny Institute? Pioneer Helen Bonny created The Bonny Foundation in 1988 for the purpose of promoting the legacy of her work. Initially it provided training but in 2004 it shifted its focus to other educational projects and changed its name to The Bonny Institute. The Institute used an image of a Phoenix in its logo; Helen Bonny chose the phoenix as her special symbol, representing continual growth and rebirth. In 2008 The Bonny Institute concluded its work, came to closure, and transferred its resources to its sister organization, the Association for Music and Imagery (AMI). In the spirit of the phoenix, this joining of energies invited the potential for promising new avenues of growth and renewal, and an invitation to carry forth the legacy of Helen Bonny. As a means of passing on this legacy, The Bonny Institute contributed valuable resources to the AMI, including the production of two innovative DVD films, and the donation of Helen Bonny's papers to the archive at the Paley Library at Temple University.